Obviously, if I value my health, I can't be eating things like the famous meatloaf cupcakes everyday. Saturday I came across a Food Network show I hadn't seen before, Healthy Appetite with Ellie Krieger. On the show she was making healthier versions of some American favorites. And I don't mean healthier as in no-fat, artificially sweetened diet food. She was using real ingredients, making real food...just cutting back on certain things such as oil and butter and egg yolks. Not cutting them OUT completely, just using enough to get the taste/texture benefits. 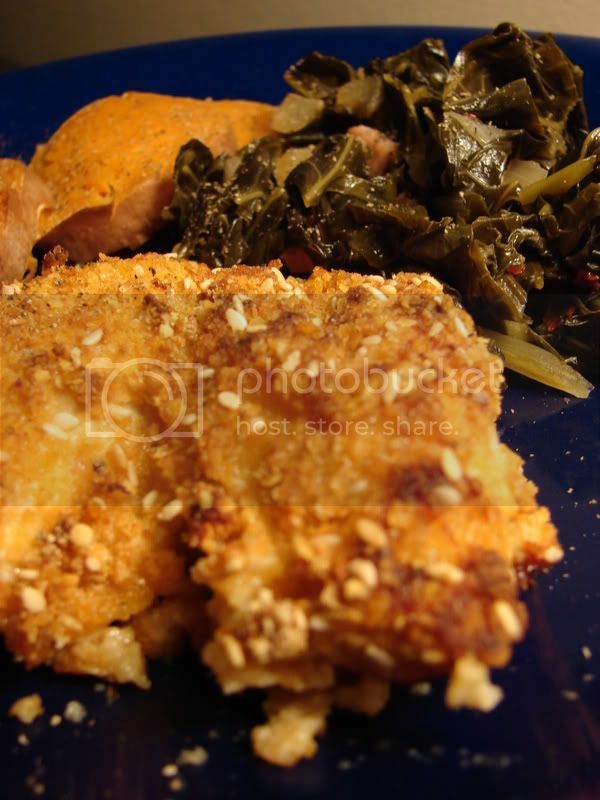 I decided to try her oven fried chicken and the short cut collard greens. Both turned out really good. The chicken was slightly reminiscent of the shake and bake I remember from childhood, but much better. The addition on Sesame seeds is my favorite touch! And it did end up being crispy on the outside and moist on the inside. 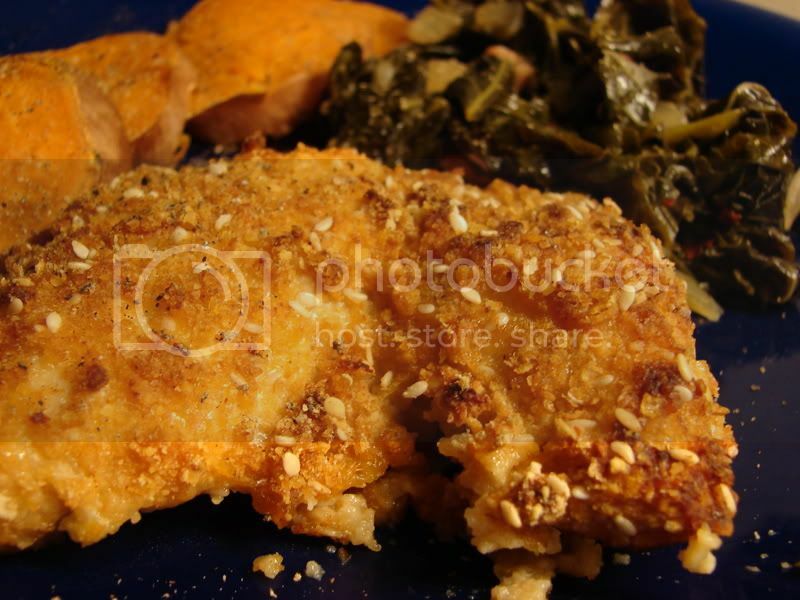 I did substitute boneless skinless thighs for the bone-in skinless breasts and thighs she used. I just couldn't find that particular cut. Plus, I just love me some chicken thighs. The collard greens were my favorite. Canadian Bacon provides the porkiness and I loved the tanginess of the vinegar with the sweetness of the maple syrup and bitter greens. I've only tried cooking collard greens once before. They took forever and didn't taste this good. These only took about 30 minutes and they were tender and yummy. And healthy!! The way you start them, by microwaving them with a small amount of water, is one of the best ways to cook them so that they don't lose all of their nutrients. I added a little liquid smoke to them, just because I had it on hand, and figured why not. And I microwave bakes some sweet potatoes to serve as another side...nothing crazy there...just a little salt and pepper was needed, because sweet taters are so good the way they are! It was a filling, warming (I made it on a cold rainy Saturday) and healthy meal. See?